I’m a bit of a nail chameleon – my nail colour choice tends to reflect either my mood or the weather. And since there’s no colour that can express “over-ate at Xmas and struggling to get back on the wagon”, I thought I’d try the weather instead. British weather? May as well have a different nail every hour then eh? Overall, the winter season has had us donning dark hues on our nails. Bleak greys, boozy burgundies, party glitter and dark navy – it’s all been very heavy and high impact. But it’s January now, a new year! The faint whiff of spring is in the air but the weather is still very much cold, crisp and utterly pants. How can I reflect this on my nails?? Easy. Named after the street in Chelsea, Callow Street by Nails Inc is a lovely teal-grey shade with the teeniest hint of metallic olive sheen. It’s actually a very unusual colour – I would never have picked it out myself normally but its really changed my opinion! A perfect January colour – dark enough to match a gothic wintery mood yet optimistically drawing a hint of colour back into our lives. Gosh, I can’t wait to start cracking out the pastels soon, all these dark colours are staining my nails to shiz.. The consistency of this polish wasn’t as smooth as other Nails Inc polish that I’ve tried but it did give a good, thick, even coverage. I hate nail polish that paints on streaky and thin! 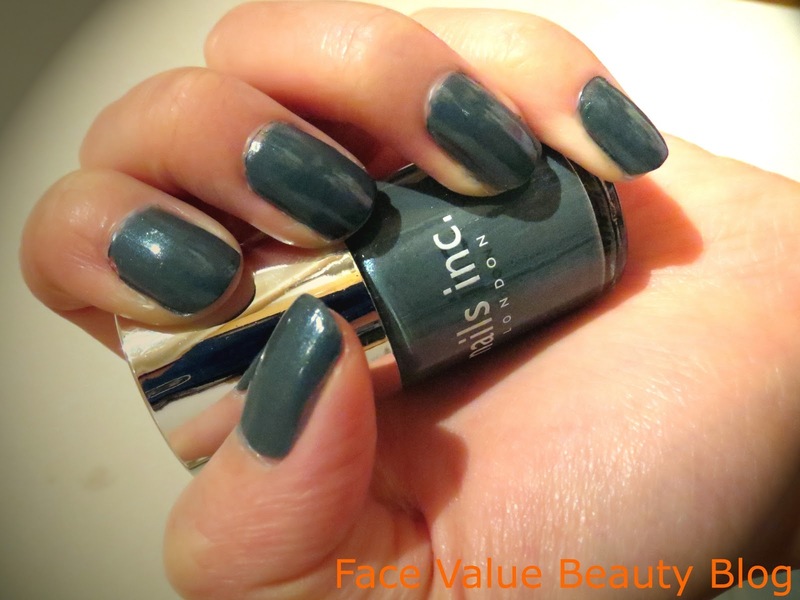 I can always rely on Nails Inc for a good quality paint job, especially when at £11 a bottle! Make like Caggie, Millie & Binky and team this polish with expensive looking accessories, fur trimmings and big boufy hair. OR just put on your onesie, sit back with a cuppa and admire your nails while you wait for January to be over. Guilty. What colours are you wearing on your nails during this transitional winter-spring period? Has anyone actually managed to get back on the wagon? I'm wearing Chanel in Blue Satin which is one of my favourites. Expensive nail varnish but worth it in my opinion. love this post – I like you bring a sense of humour yet are informative at the same time!